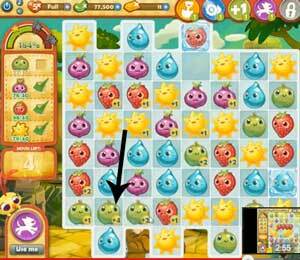 These Farm Heroes level 219 cheats and tips will help you beat level 219 of Farm Heroes. 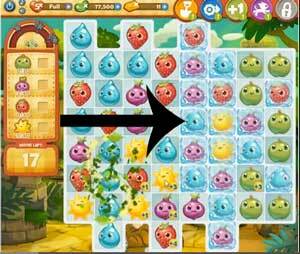 The objective of Farm Heroes level 219 is to pick 30 apples, 40 onions, 40 strawberries and 40 suns in 18 moves. In the beginning of this level, it’s tempting to go for the ice blockers. Also, the apples are segregated from the rest of the cropsies, and it can be tempting to unify the board. Leave them alone for now. What you want to do instead is focus on the strawberries, suns, and onions instead, because they can be immediately collected. When collecting strawberries, suns, and onions, try to make big matches with them, such as matches of four and five, so that their value is raised as well as any surrounding cropsies. This will get you much closer to your goal much more quickly than if you simply made matches of three. The more you collect in the first few moves, the easier this level is going to be for you. Try to work on the bottom of the screen — there’s a chance you may cause some cropsies to cascade, which will help you out greatly when trying to conserve moves. Once you’ve collected a substantial amount of cropsies, you’ll have to deal with the ice blockers that are preventing you from getting the apples. Fortunately, if you were collecting cropsies, there’s a good chance most of the ice has been taken care of, and you will only need to make a few more matches to completely unify the board. After all, you only need to make a match of three or more to break the ice. If you are feeling lazy, or don’t have many good match opportunities, another good way to deal with the ice and save some moves is to use your shovels to break them. However, this way only breaks one ice block, so if you are going to use it we reccommend that you do so later in the level, when one or two ice blocks are left over that might be difficult to match up. Once you’ve freed up some space, go for the apples. Make sure you don’t leave them for the very last minute — if you do, you might not have enough moves to finish up the level. 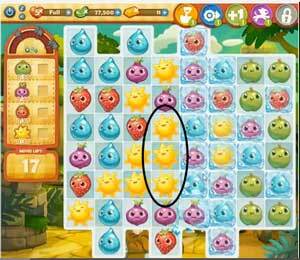 By the time you go for the apples you should have around 5 or 6 moves left. Be sure to check that you’ve fulfilled the rest of your cropsie requirements when you reach the apples. The last thing you want is to get all 30 apples and realize that you fell short on collecting another cropsie.